The National Trust is a UK institution synonymous with the preservation of the landscape and history of the British Isles. With a National Trust promotional code you can now help the Trust continue their activities and get a discount on your next purchase from the National Trust online shop. If you’re looking for the perfect gift item for the home or outdoors use one of our National Trust vouchers and support the great work they do. Founded in 1895, The National Trust is an independent non Governmental UK conservation charity, protecting historic places and green spaces, and opening them up for everyone. With over 3.7 million members, 61,000 volunteers, and over 350 properties, landmarks and sites under management, National Trust plays an important part in protecting the heritage of the UK. Over 17 million people visit National Trust property in the UK each year, while almost 50 million people visit countryside and land controlled by the Trust. It doesn't stop there however. National Trust also takes care of woodlands, forests, fens, shorelines, farmland, downs, moorland, islands, archaeological remains, mansions, nature reserves and even whole villages. National Trust are also famous for their shops, found across the UK at stately homes and other sites that sell a variety of locally made produce, crafts and gifts. The National Trust online shop also offers a range of their most popular items and with one of our National Trust vouchers, you can enjoy great savings on great gifts and other items. Gravity was discovered on National Trust land where Sir Isaac Newton's fruit tree can still be found. Each year The National Trust serves over 3.5 million mugs of tea in café’s and restaurants on its property. Harry Potter was filmed at Lacock Abbey, a National Trust property. The National Trust looks after 4 World Heritage sites. Among the more unique jobs at the National Trust - they employ 120 volunteer fire fighters, 15 volunteer pilots, two beekeepers and a shepherd. The National Trust YouTube channel is full of the latest news and information on trust activities. There you can get information on the properties and land they manage, as well as details of their latest events. All items can be ordered for delivery to your door, so for the perfect gift, or an accessory for your next hiking trip, make sure you use a National Trust promotional code to get great savings off your next purchase. When you are finished selecting products, click on “Basket” to view your selection. Login, register as a new customer or checkout as a guest. Enter in your billing and delivery details. For orders over £50 UK delivery is free of charge. Their no quibble 30-day returns guarantee means that if for any reason you are unhappy with your purchase, you can return it to them in its original condition within 30 days of the date you received the item, unopened (with any seals and shrink-wrap intact, clothing must have labels attached if possible) and they will issue a full refund for the price you paid for the item. If you have a question regarding your order you can contact The National Trust online shop order fulfillment team by email or by phone. National Trust loves to hear more about their supporters, so if you fancy getting in touch, you can contact the National Trust through social media here. Looking for something to do on a sunny Saturday or Sunday and wondering where to go? Want to visit beautiful coastlines, walk through wild countryside, relax in exquisite gardens or explore historic houses? With the official National Trust mobile apps you can find a National Trust site near you, wherever you are in England, Wales, and Northern Ireland with their handy mobile apps on Android and iOS. 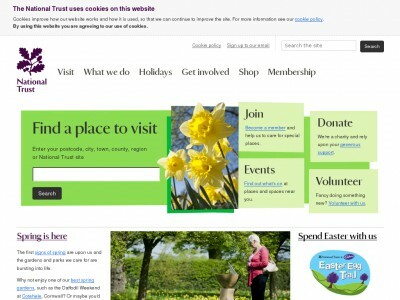 Buy now online at www.nationaltrust.org.uk. Nationaltrust.co.uk is a company that stands for a truly good cause, and I’m happy to let you know that you can save more when buying their great products by using a free National Trust promotional code. National Trust offers a great selection of items that coincide with their great cause, and those products can be easily discounted by using a free National Trust voucher. So the next time you are purchasing from this wonderful website, do yourself a favor and purchase with a National Trust promo code!